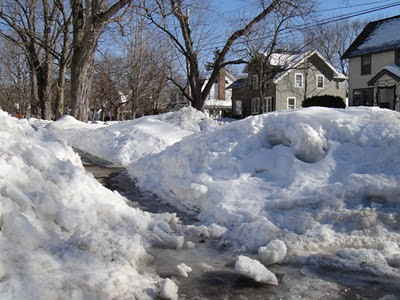 Because of the large amount of snow that has fallen in the last 6 weeks our town streets and crosswalks have become very difficult to navigate. Driving as well as on-street parking in almost any part of town has become very hazardous. Car owners are subject to personal and/or vehicle damage because the streets have become so narrow. 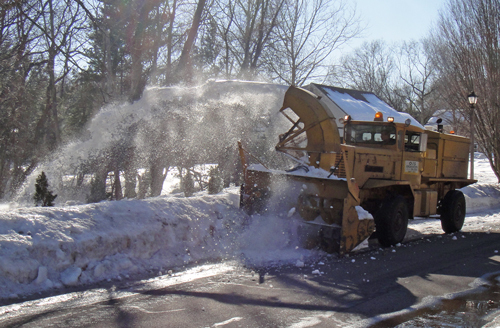 Given that the weather has not cooperated until recently the DPW has become more proactive. In addition to reducing the levels of snowbanks at intersections, the DPW is now currently widening streets in town via the use of privately contracted equipment (see photo below). I applaud these efforts and am always appreciative of our Dept of Public Works... they are an important element in determining the quality of life in our town. Select Board: Please take notice of these efforts and their importance to town residents when finalizing the FY2012 budgets! 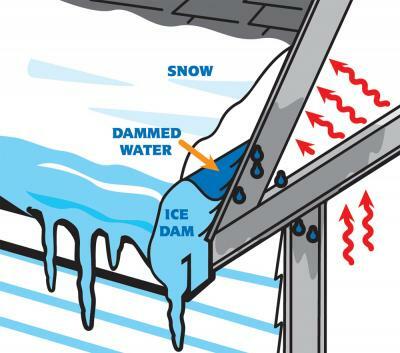 My wife and I have lived in our house for over 30 years and have never experienced the degree of ice dams on the north side of our house as we have this year. We also have never had any water intrusion damage of the interior ceilings/ walls and we hope to keep this record intact. 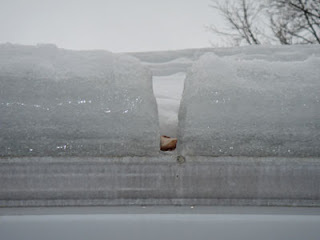 About 8 years ago, we had new roof shingles installed with 3 feet of ice/water shield barrier used as a protective measure but as the ice dam grew thicker (~ 8”) this winter I began to get a little worried. 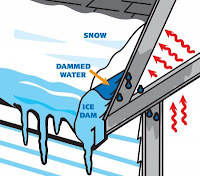 I understand the mechanics of how these ice dams are formed (see figure above) and how to avoid them but at this point I needed some way to release the water before it was too late. Brute force chiseling of the ice did not seem like a good option but I had heard about the use of calcium chloride salt as a possible remedy. 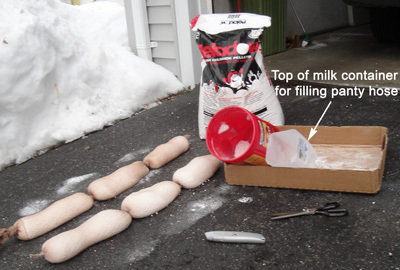 12 hours after I had started the process, there was a 2-3" wide slot formed through the 8" of ice. The roof shingles were exposed and free of ice and water was flowing freely into the gutter. Salt water has started melting snow and ice in my downspouts as well. 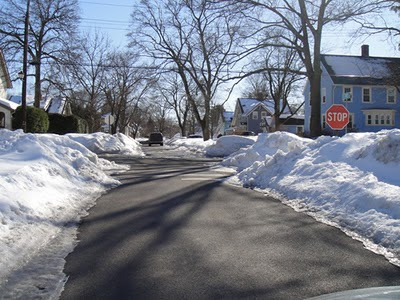 I'm now hoping for warm weather that will slowly melt all of the snow that is now around our house without causing flooding in the basement. 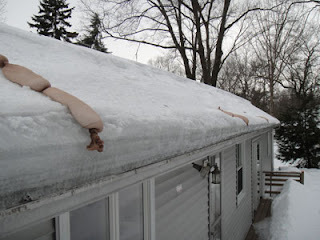 I expect that there may be some salt related problems with grass and vegetation in the immediate area of the downspouts but this seemed to be a small price to pay to avoid water damage to interior ceilings and walls. 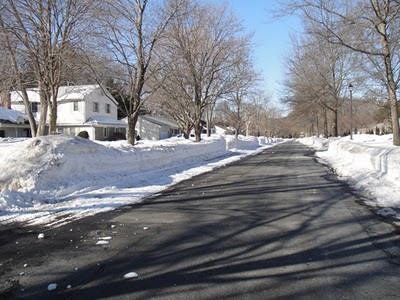 It been a long time since Longmeadow residents (as well as the rest of Western Mass) have seen the type of winter as we have this year. Stop in and chat with Stan at Brightwood if you have problems similar to mine. Tell him that I sent you. Let's hope that the rest of the winter will be mild without a lot of rain or additional snow!